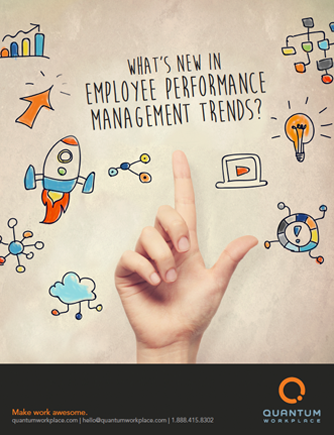 What’s New In Employee Performance Management Trends? There is significant change happening in the workplace today, and we’re all doing our best to keep up. Technology continues to advance at a break-neck pace, while for the first time in history, five generations are merging into the workforce at once. HR and leadership teams are challenged with evolving their performance management strategies to address the needs of their employees – whose interests and motivations span a broad and diverse spectrum - while also supporting the business strategy and bottom line, both for today and into the future. If your company’s employee performance management strategy is succeeding (good for you! ), we want to give you the information you need to keep it on the upswing. And if you’re struggling with low engagement or high turnover, we want to help guide and inspire you by sharing some of the performance management strategies that the most engaged organizations are using now. Download this ebook for the most current, up-to-the-minute employee performance management trends.